As the weather finally starts to get a little chillier, Drexel University sports fans pack up their outdoor gear and say goodbye to the field hockey and soccer seasons. We’re ready to head inside for the winter. 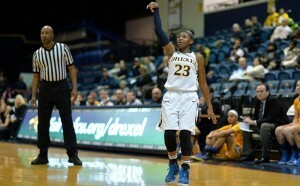 Again, it looks like the highlight of this year’s winter season might come from the Drexel women’s basketball team. Thus far, they’ve outplayed their male Dragon counterparts, who are 0-2 for the first contests of the year. Women’s basketball, however, has jumped to a 1-1 lead as they began their season last weekend in the Women’s National Invitational Tournament Preseason. The Dragons are starting this year off on the right foot: preseason rankings seated Drexel in the number two spot, and preliminary all-conference teams selected two Dragons. All Colonial Athletic Association honors were given to both junior Sarah Curran, who was named to the first team, and senior shooting star Rachel Pearson, who earned herself a spot on the second team. Last weekend, the team split, picking up their first win the first game of the season, a matchup at home against Dartmouth University Nov. 13. Just like last year, the two sharpest players for Drexel were Pearson and Curran, two Philadelphia area native players who came from the same high school, Archbishop John Carroll. Pearson and Curran carried the team to victory and scored 21 and 20 points respectively, with their combined 41 accounting for more than half of Drexel’s overall 69 points. And, just like last year, the Dragons seemed to do their best work in the first half, leaving something to be desired in the final minutes of the game. While Drexel beat Dartmouth in the first three quarters of the matchup, Dartmouth came back in the final quarter of play to outscore the Dragons 22-14. Luckily, the Dragons had some cushion to fall back on from their early lead. The final score came to 69-53. The first game of the season also marked a return for senior point guard Meghan Creighton, who missed the end of last season due to a torn meniscus in her knee. All in all, the game was successful for the Dragons, as former stars lit up the board (including graduate student Jackie Schluth, who came back this season to compete as a Dragon once again), and younger players like sophomore Kelsi Lidge had the opportunity to step into bigger roles. The team’s new roster also features a Virginia Commonwealth University transfer, Jessica Pellechio, who is now in her first active year on the court with the Dragons following the redshirt year she took last season. The second game of the season wasn’t as sweet, however. The Dragons dropped their second match to the University of South Florida, ranked No.20 in the Associated Press poll, Nov. 15. Again, it was Curran and Pearson who led the team with 15 points each, but it simply wasn’t enough to pull out a Drexel victory. The Drexel defense was lacking, as the Dragons gave up 73 points to the aggressive Gator offense. However, it wasn’t the defense that lost the game for the Dragons. In the final two quarters, they just couldn’t get their offense up to snuff. In the final period of play, Drexel was outscored 16-8: strikingly similar to the first game of the year. While the Dragons were only down four going into halftime, they ultimately ended up losing by fifteen, with a final score of 73-58. With any luck and hopefully hard work at practice this week, the Dragons will have cleaned up their second half offensive strategy a bit. Drexel will hit the court at the Daskalakis Athletic Center once again on Nov. 21 to take on Saint Bonaventure University in the final game of their WNIT Preseason run.